I really should read the blurb carefully before making any assumption. 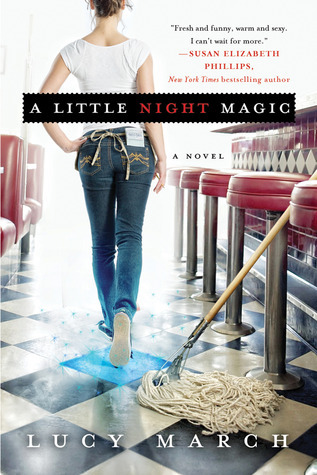 Not surprisingly, I had assumed that A Little Night Magic was chick lit, which I guess it could be, if not for the paranormal elements . Moving on to the review. Olivia is a waitress at a small town waffle house, specifically, Crazy Cousin Betty Waffle House. She spends her days serving waffles,mopping floors and longing for Tobias, the cook, who apparently doesn't feel the same way. Just as Olivia decides to make a change and leave the town forever, an old woman walks into the waffle house and changes her whole life. She helps Olivia discover and harness her magical power. Olivia is a good character, realistic and believable most of the time. She has three best friends with whom she meets on Saturday nights to share her stories - I found them to be a fun addition. The romance between Tobias and Olivia is also pretty cute to read about. A Little Night Magic is one of those books that you pick up to keep you occupied at the airport or on a long road trip. It's cute, fun, entertaining and doesn't require much concentration to enjoy the story. Lucy March's writing keeps you engaged. It's not the kind of book that leaves a lasting impression but it's perfect when you're looking for a light and enjoyable read.